Leeds City Council chief Tom Riordan will take the hot seat at a United Nations Association sustainability event in Harrogate to discuss how the Leeds City Region is meeting the organisation’s development goals. 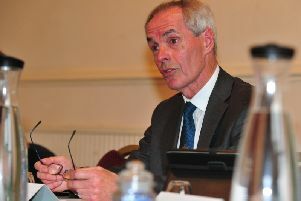 The event is being hosted by the Harrogate branch of the United Nations Association, which was founded by local businessman Clive Wilson. It follows Clive’s pledge last year to dedicate the next 15 years to helping the UN deliver its targets for sustainable development. The goals include bringing an end to poverty and promoting sustained, inclusive and sustainable economic growth, full and productive employment and decent work for all. “It’s so important to have people in place regionally who can drive forward the UN’s 17 Sustainable Development Goals, which represent the most powerful vision ever agreed by humanity,” said Clive. The Harrogate group has so far focused its attentions on five of the 17 goals, which look at education, energy, infrastructure, creating resilient cities and ensuring sustainable consumption patterns. “After a lively meeting about sustainable and affordable energy we felt it was important to engage local authorities in the debate and understand how they are interpreting the UN’s goals at a regional level,” explained Clive. The meeting takes place on November 14 at Primeast, 5 Greengate, Cardale Park, Harrogate, at 6pm. A few places are available for non-UNA members and admission is strictly by prior arrangement. Email clive.wilson@primeast.com.